If you read any parenting advice about how to make your kids love reading, you'll discover the most common advice is to read with your children. Fair enough, but where do you begin? The Carrot Seed by Ruth Krauss - I'm amazed by how few words Ms. Krauss needs to tell a story of perseverance in the face of "everyone" saying something can't be done. Of course, the fabulous illustrations come from Crockett Johnson who also wrote the next book on this list. Harold & The Purple Crayon by Crockett Johnson - We love the twists and turns of Harold and his imagination. There is, of course, a whole series of books capturing Harold's adventures, but it's difficult to improve on the original. The Giving Tree by Shel Silverstein - probably the least "forgotten" of the classics, but still a favorite. This book demonstrates so many important lessons about contentment, selfishness, selflessness, and generosity. My kids learned the intonation and cadence of this lyrical story long before they could read. 10 Minutes Till Bedtime by Peggy Rathmann - This story is about a kid who tries to squeeze every last possible second of play in his day before bedtime. Any person who has ever babysat or had kids can appreciate the chaos involved in getting a kid to bed, and this book captures that process perfectly. We love this book more for how it allows for observation of what all of the little hamsters are doing and empathy for the role of parents (plus we love yelling "BEDTIME" all together). 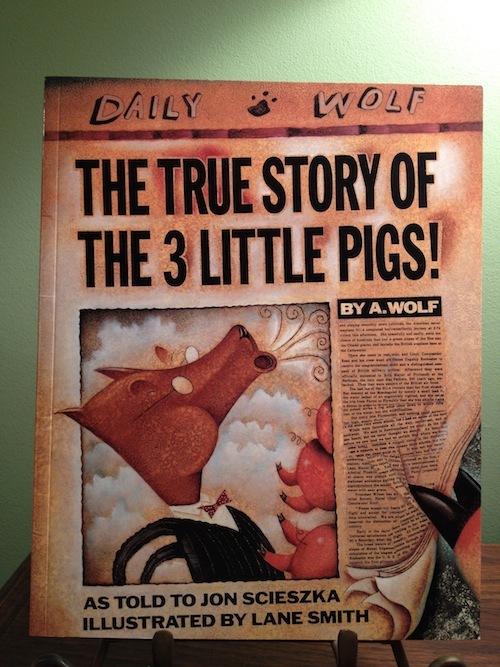 The True Story of The Three Little Pigs by Jon Sceiszka- This twist on the classic fairy tale shows the ridiculousness of lying. As a contrast, the story gives us a great tool to talk about honesty. That's a few to get you started. Next week I'll bust out a few "new" classics to round out the collection. People Don't Change. They Do Grow.